Great pictures Kat. My mouth almost watered seeing the food on the table . I am also sorry about your loss though that happened seven years ago. I hope such pain will lessen knowing your mom never really left because she will aways be in your heart. Aww. You’re sweet, Sarah! I know that my parents are happy in heaven watching over me. Beautiful photos. Your aunt did a wonderful job with the food. Everything looks fantastic. Very yummy. wow, parang ang sarap ng mga pagkain. i wonder lang if pao ids also the taro? maganda rin ang presentation niyo sa fiesta. gusto kotuloy kumain. isn’t taro= ube? when i think about it, it has similar texture with ube. 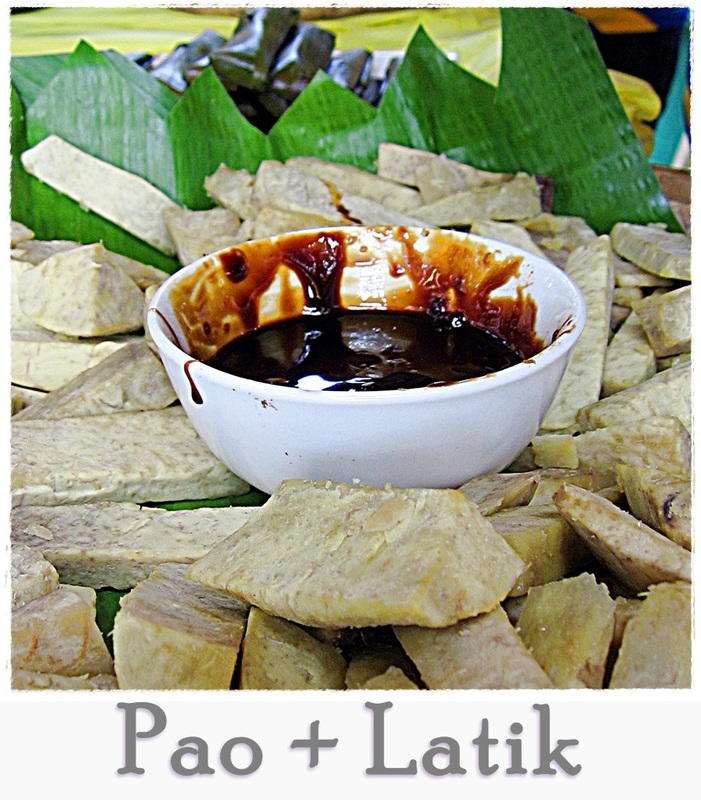 That pao and latik looks sooo delicious! Where else can I try that? I really don’t know. I seldom see it in our market. i love the 4th photo, sarap magmuni-muni. 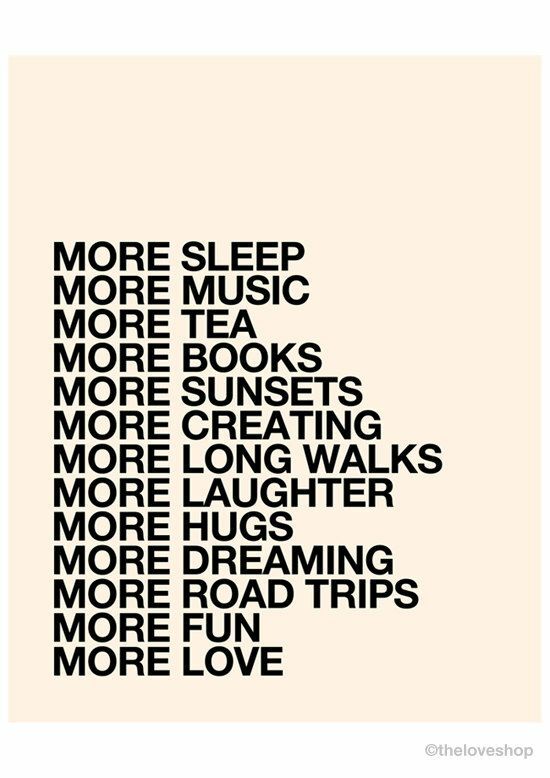 i also want to have more Me Time and road trips. I never went to an event like this, with food served on a boat, etc. I also like Giselle’s dress, very ocean inspired. I have been graduated for 10 years now but I haven’t attended any alumni homecoming in our school due to very tight schedules at work. Our higschool batch did a yearly get-together but I only attended once. hehehe. busy yet you had two weeks of fun and you did had great food to eat. nice pics! You sure have been busy! 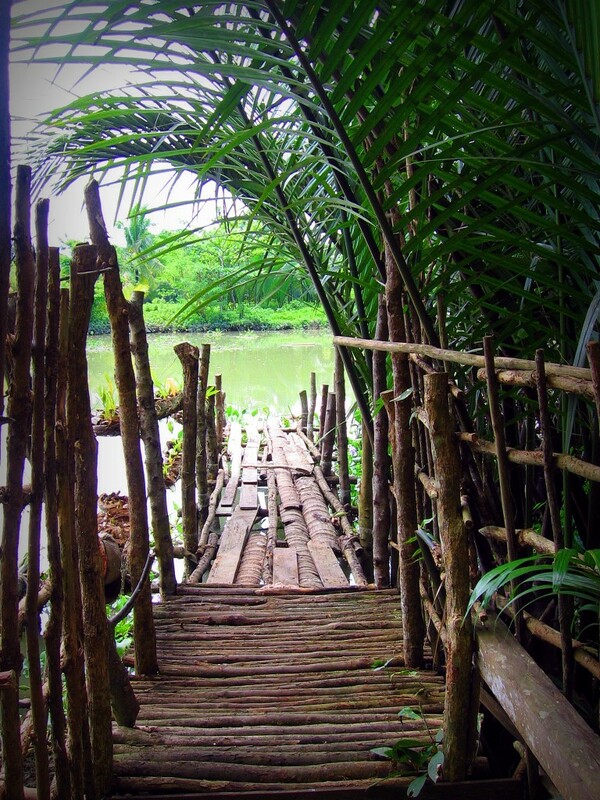 I like the photos of the lake and the bamboo bridge. I could spend all day in a place like that reading a book or just being. great photos and the salad looks so yummy!!! How do you make that salad? 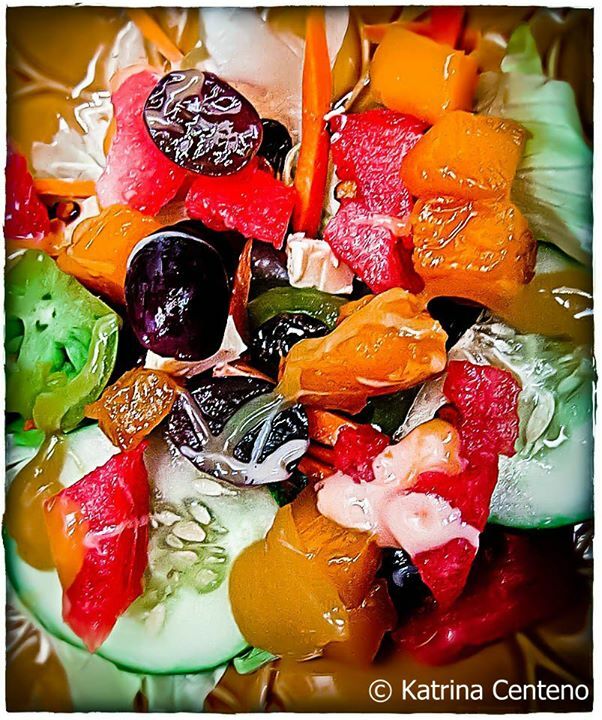 It doesn’t look like your usual fruit cocktail salad. It is the salad from the salad bar during the fiesta. We cut up fresh fruits and veggies: lettuce, cucumber, tomatoes, carrots, grapes, mango and watermelon. Plus, raisins and cheese. Dressing is store-bought: thousand island and honey mustard. I hope you had fun. Listening to Giselle is such a joy talaga. baklang bakla siya. I love her natural look. Namiss ko lalo mga food sa Pinas, especially the Latik, wow wow wow! She was funny, albeit adult humor. BTW, praying for your mom’s soul. 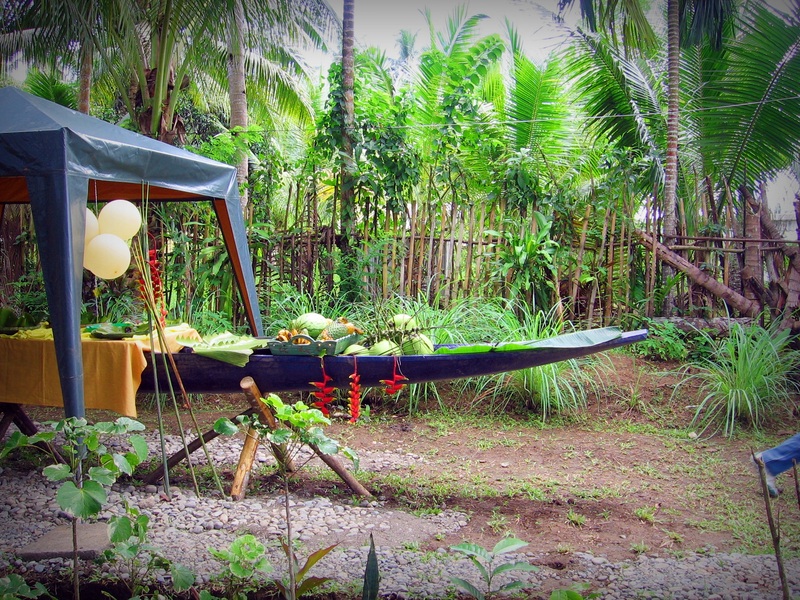 the boat as table idea was from their creative caterer. the caterer also owns the nice venue. nakaka miss umattend ng fiesta, yung mga palaro, pagkain tapos, kakatapos mo lang kumain inaalok ka na ulit kumain sa ibang bahay…hay! 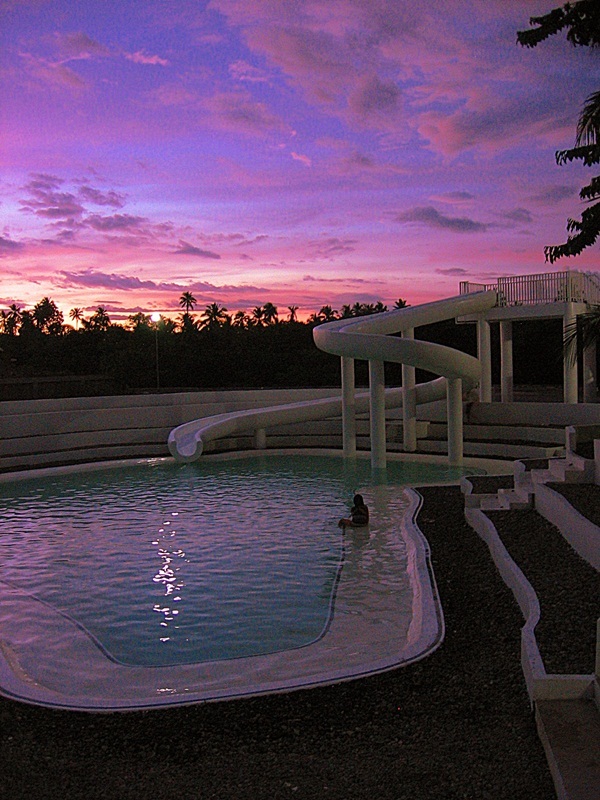 breathtaking sunset picture dun sa may slide. 😀 Your place looks like an area where time slows a bit. I feel like resting in a hammock after seeing your post. Thanks for this refreshing mental vacation. The photos certainly captured the many events that was happening concurrently 🙂 I think the food served on a banca was creatively planned. Nakakatuwa to incorporate these things and make lunch more festive in a way. 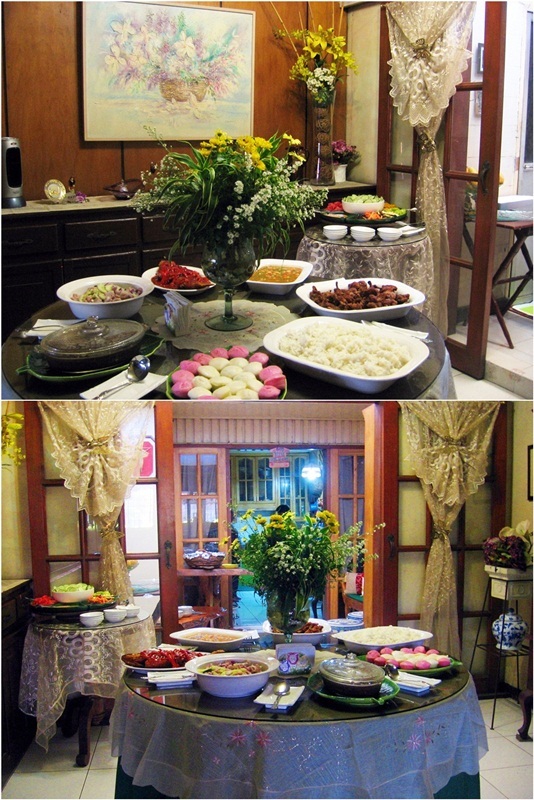 Also, the food prepared for the fiesta were in abundance. Nakakagutom 🙂 We used to celebrate fiesta in our place but I don’t know why this has stopped for many years now. Thank you for sharing the photos that delineates enjoyment, blessings and a fun-filled life! wow! ang dameng pagkain, kakagutom. The pool looks so nice and the view is so beautiful. Mouth watering good foods. IT seem like you had a great time with your love ones. Great pics and it made my tummy growls… hehehe. Also it made me think about what my parents and my sister’s family did in our province. Me and my family wasn’t able to go with them due to some financial problems. Anyway great pics and great food. Loved it! grand reunion! more so with a celebrity performer. astig! great two weeks…lots of food and water! Life is beautiful when spent with family and loved ones. Now I’m living away from my parents and siblings, I always look forward to spending time with them. Hi, Kristen! Kumusta man diha. 😀 Baka endemic to my city ang pao. I’ll have to ask around the Bisaya term. 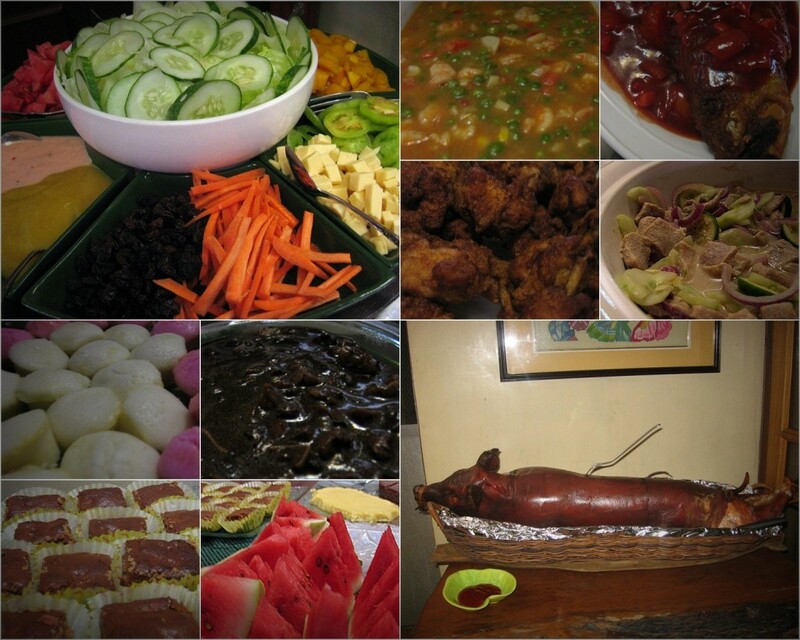 All the photos are great oh, love the foods especially the lechon yum yum! 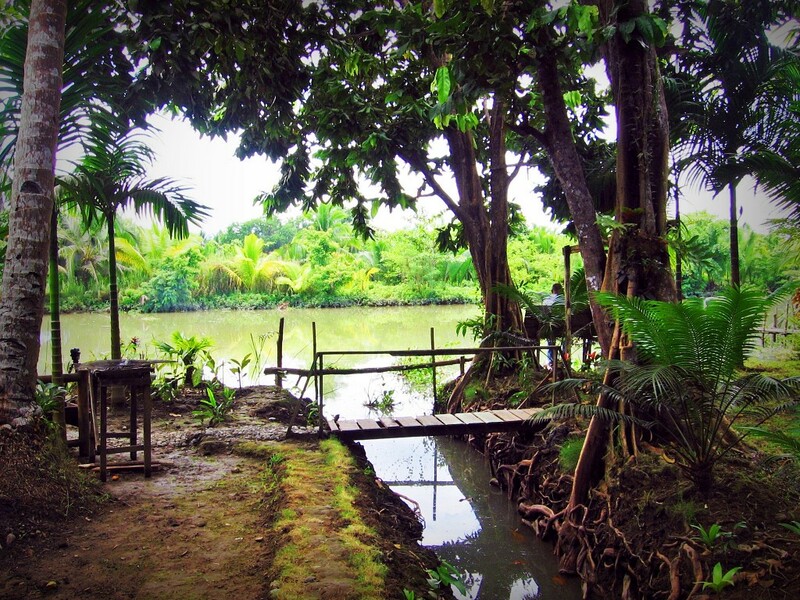 Nakakamiss ang probinsya. 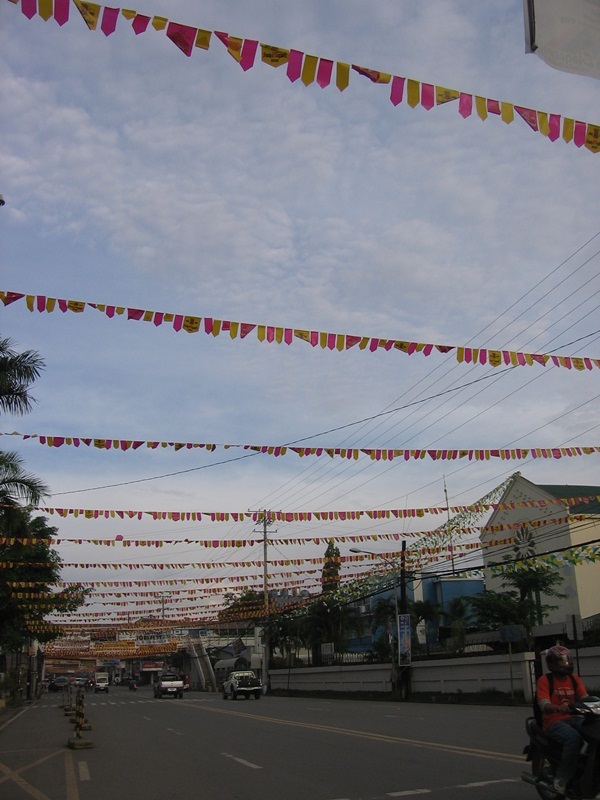 Ang fiesta, lace curtains (syempre yun ang napansin XD), atbp! Wonderful pictures! What your cousin did to your photo was truly amazing. I wish he/she were my cousin too coz I’m really awful at taking pictures. LOL! I know. I’m lucky! Practice makes perfect. Just keep on taking pictures. COOL POST! 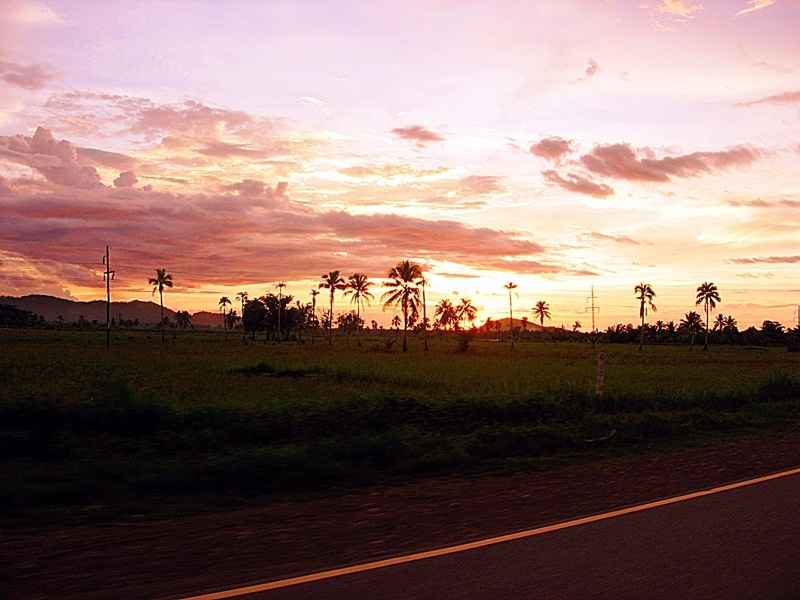 I like the sunset photo.. great job! You’ve a very fruitful two-week experiences, from homecoming, foods, fiesta, birthday, Sunday service, and even the very phenomenal solar eclipse which you’ve failed to witness. It must be very exciting. Seems like it. wow really nice event. how i wish i can go out and be happy too and forget all the worries of life. oh, we do not need grand events to be happy! This is nice. 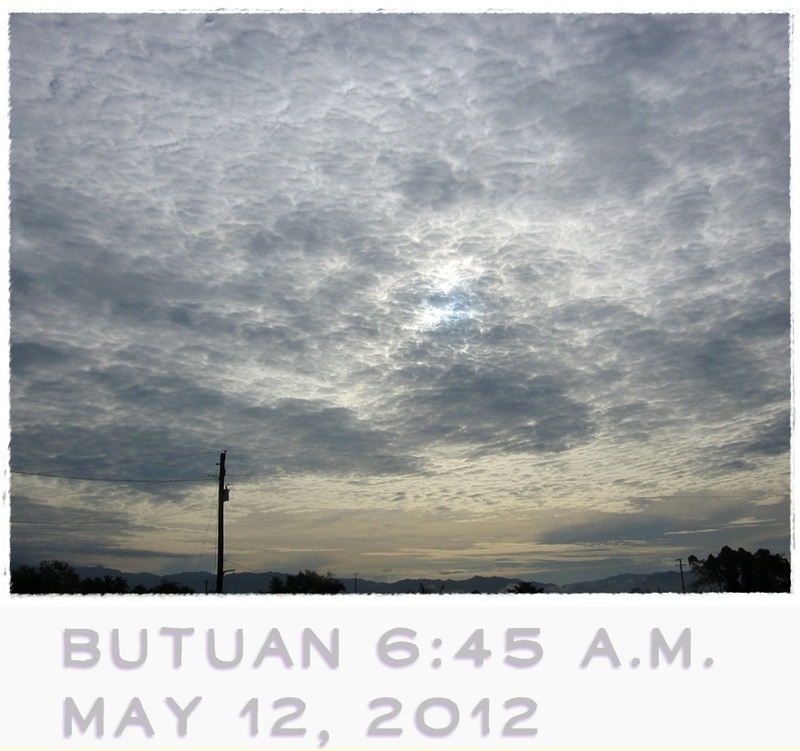 Ive never been to butuan, but i love the south. 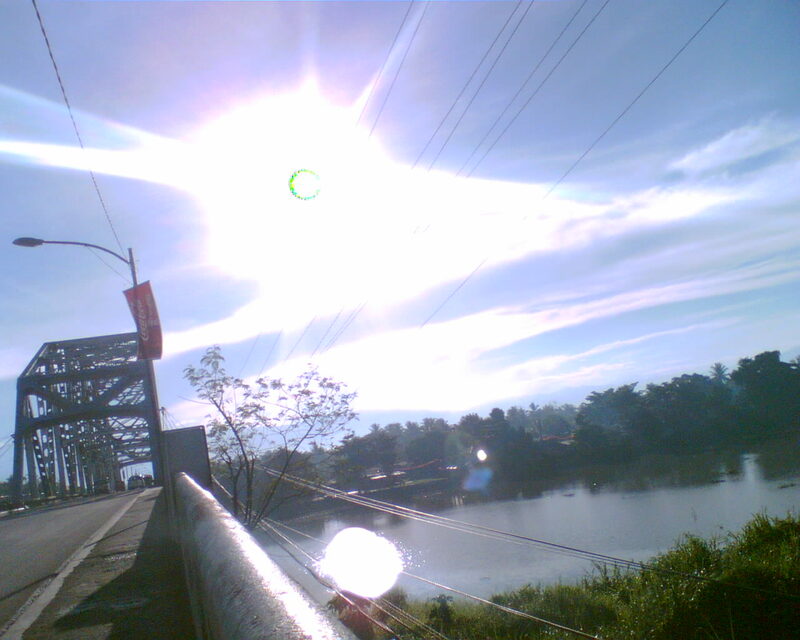 We lived in Cagayan de Oro for a couple of years. The people were very warm. That’s why the south has always been a home to me. Haha! Sabay sabay tayo makiki-fiesta sa mga kapitbahay at kamag-anak ko! LOL! Reunions! 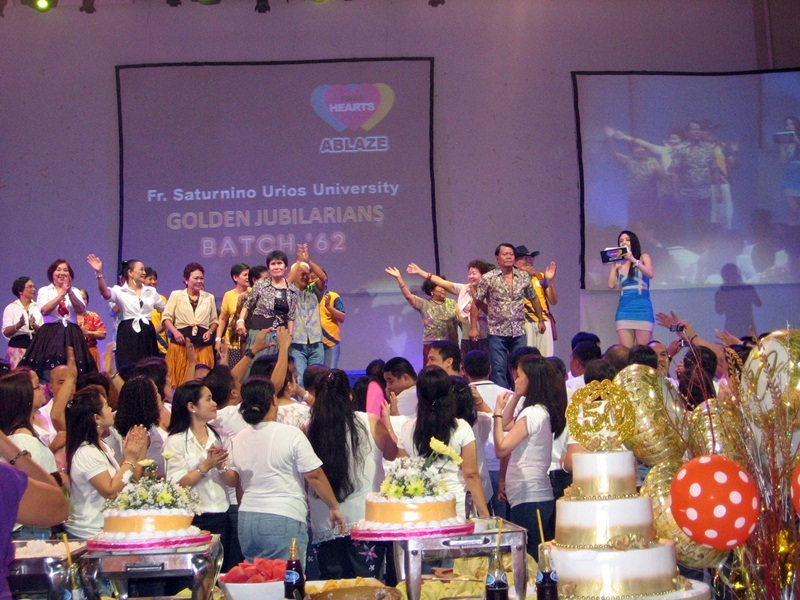 Which reminds me that our HS reunion is upcoming! Need to shed a few pounds off! I love the shots! Even without description, it communicates well what happened that day.